A recipe for skillet buttercup squash with bacon. 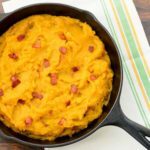 Buttercup squash is baked, mashed and cooked in a skillet with bacon and onion. It is a wonderful side dish. Cut squashes in half. Scoop out and discard seeds and stringly flesh. Place squash halves cut side down in a baking dish (or two baking dishes if needed). Add about 1/2-inch hot water to the dish(es). Cover with foil and bake for 45 minutes. Allow squash to cool to room temperature. Scrape out the flesh into a bowl and discard skins. Mash squash thoroughly. You should have about 4 cups of mashed squash. Brown bacon in a medium skillet. Use a slotted spoon to transfer bacon to a plate. Pour out most of the bacon fat, leaving only about 1 tablespoon in the skillet. Add onion to the skillet and cook over medium heat until soft and translucent, about 5 minutes. Return cooked bacon to the skillet along with squash, butter, and pepper. Stir to combine. Cook until thoroughly heated, stirring occasionally.